Due to some sort of buzzing, I woke up while it was dark, showered. Then David tells me that it is only 4:30 so I had to decide whether to go back to sleep with wet hair or stay up and blow dry it. I tried going back to sleep but without flattening my wet hair. Then the real alarm went off at 6:00am. Don’t get up until the sun gets up. 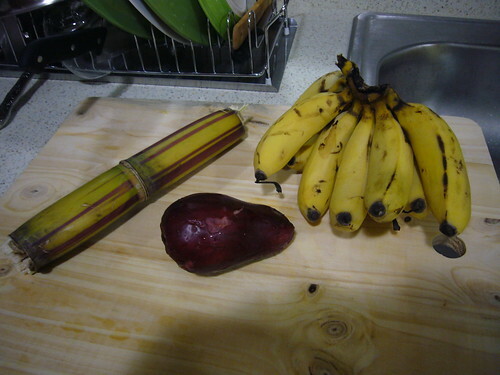 Breakfast fruits: sugar cane, rose apple and fingerling bananas. I asked a staff person what the proper name for the fingerling bananas and she said just small bananas. 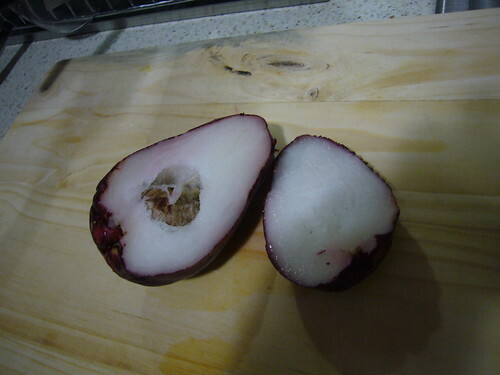 For breakfast, I cut open the rose apple. It is pear shaped, soft flesh and I didn’t eat the peel since I thought it was a bit sour. The flesh is mild taste probably like a guava. I heated up the rest of ackee and salt fish and had that too. Back to the office on campus. We are in a different building Business, since we needed a larger classroom. It is much cooler here. But then the air conditioning broke down. We had lunch catered in from the Social Welfare department which is the training program for people at risk. 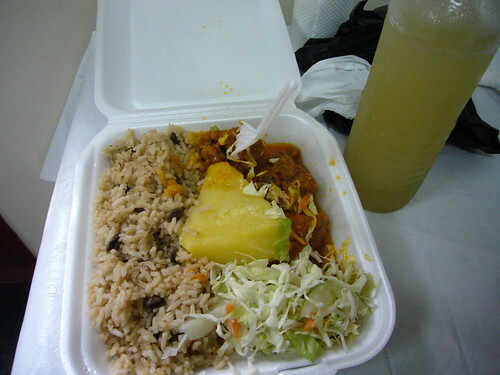 I ordered sweet & sour chicken, rice and peas with a yellow triangle. I had to ask to identify it, a yellow yam. And since I asked for natural juice not fruit juice, I got pineapple with ginger. This is really nice combination since the ginger cuts the sweetness of the pineapple. Some of the other drinks didn’t arrive since our class order was placed late. Apparently the coconut water was left out to thaw and thus forgotten. David had stewed beef. We left campus. To Jampro (trade & development) and back to lawyer. Then off to another afternoon at the bank. The parking lot security guard came inside to find us since we were the last car in the lot. Aside from being Chinese, he had watched us trying to park the car, face out. They seem to always want the car parked face out, signs everywhere for it. Best sign, watch out for sleeping policeman – speed bumps. He asked for a bottle of water which confused me but I didn’t have one. David said he said that he was really asking for a tip. Back to campus office to pick up E. We went to MegaMart which is like a Sam’s club for water and groceries. Then we went to Dragon Palace chinese restaurant. It is upstairs at a mall, bigger and fancier with decor and tableclothes. 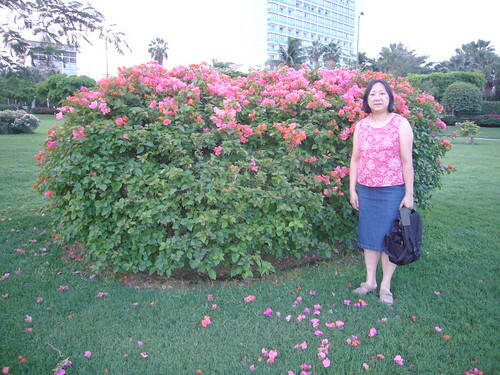 It is the first time that I have seen other Chinese and heard spoken Cantonese. Even Chinese opera music was played. We order beef noodles, black mushrooms and vegetables and beef fried rice. E doesn’t eat chicken, pork or oyster sauce. And its the same crunchy Chinese vegetables: bok choy, cabbage, carrots and baby corn, green onions. I am thinking there isn’t much variety in food here. Subscribe to the Comments RSS. Leave a trackback from your site.